A one-time Parallel Lives – perhaps a callback? And oddly creepy art for a rather simple piece, too. A lot of decks will pick the permanent effect, but there are some little nuances here, like the fact that you can cast Second Harvest as a surprise when your opponent is trying to race your herd of tokens and they all happen to be tapped. It’s obviously good with all the newer cards that create a token that’s a copy of something that already exists (like with a comes-into-play ability), but then again most things are. 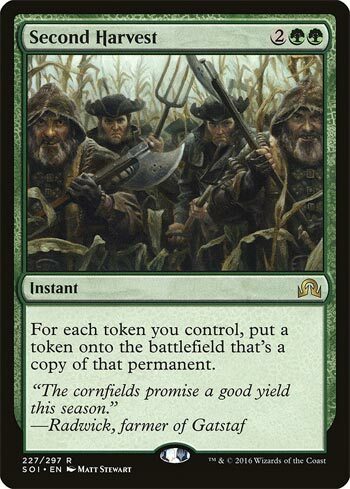 Second Harvest is certainly powerful from the looks of it: replicating every token you have can turn a massive army into an even more massive army, a pile of Treasure or Clue tokens into an even bigger pile, and can just compound your opponent’s misery. It’s a quintessential snowball card in that, if you have a good board before casting it, your board gets even more nuts. And it’s an instant! Second Harvest is good if you’re ahead; from behind, it’s awful. You need to be able to snowball your board state to where this will be able to reliably wreak havoc. It also pairs well with the Embalm/Eternalize creatures from the Amonkhet block, which is certainly fun. Next article[Goat Format] D.D. Warrior Lady – Yu-Gi-Oh!